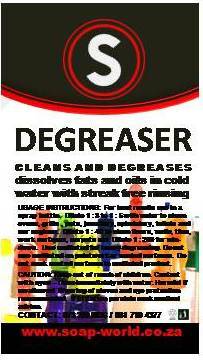 USAGE INSTRUCTIONS: For best results use Soapworld Degreaser in a spray bottle. Dilute 1:3 to 1:5 with water to clean ovens, grills , pots, jewellery, upholstery, toilets and car engines. Dilute 1:40 to clean floors, walls, tiles, work surfaces, carpets etc. Dilute 1:200 to clean windows. Use undiluted for heavy degreasing. Do not use undiluted on paintwork or leave for longer than 5 minutes on coated surfaces.